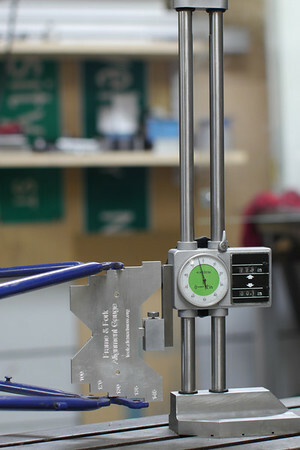 A couple of years ago I made a popular frame and fork alignment gauge that was being sold through my blog (we sometimes call it the “Christmas Tree”). I still am frequently asked if I have any for sale. They are a made of steel (vs 6061 aluminum) and will be more durable to shop wear. They are also a little more compact (made from 3″ wide stock instead of 4″ wide stock). The width numbers are printed on both sides, and there is a centerline scribed on the mounting tab. I’m really excited to see these back in production and easily available. Christine and I both had the month of July off this year. I’ve known that I’d be taking this summer off of work for about two years. When I first learned about that I started to think about how I’d like to spend it, and that is when I initially got interested in sailing. Sailing has really clicked with me, it has the right mix of being a slow and immersive form of travel, presenting new challenges and things to learn, and is both fun and relaxing. It’s got a lot in common with cycling that way and I’ve noticed a lot of crossover between cyclists and sailors. Our destination for July seemed obvious, we’d go to Desolation Sound. 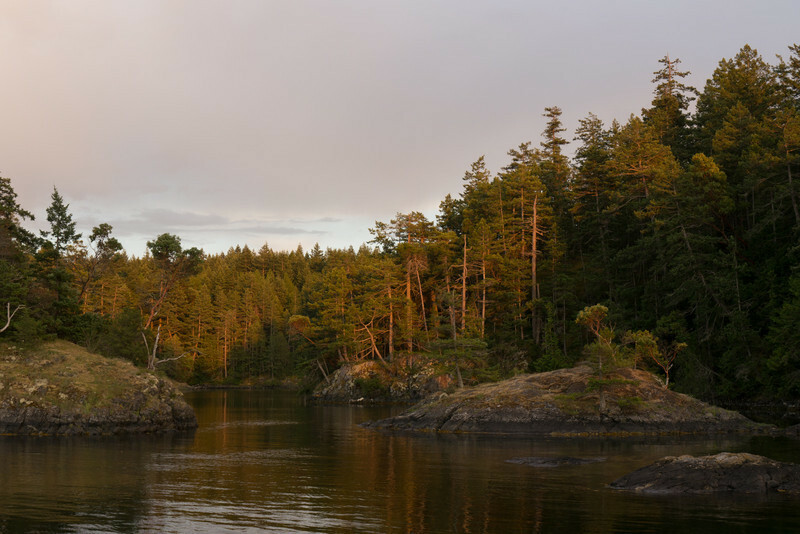 I really knew nothing about Desolation Sound except that it was a major destination for sailors and kayakers around the world, and it was also almost in our backyard. It is about halfway up Vancouver Island, in between Vancouver Island and mainland British Columbia, right where the Georgia Strait ends and dozens (or hundreds?) of islands and inlets begin. The blog has been quiet for the last 9 months because I’ve spent most of my free time preparing our boat for the trip and getting in a lot of sailing. We bought this boat (a 28.5′ Pearson 28-2) last October and in the meantime I’ve replaced all the running rigging, much of the electrical and electronics, sails, bottom paint, plumbing, lifelines and generally customized the boat to our needs and liking. 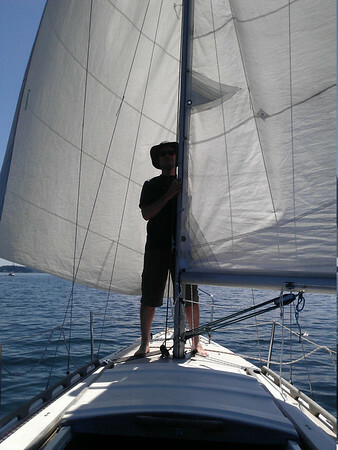 Regular blog readers might notice that this is our second sailboat in a short period of time. It’s a bit larger than the previous one which made it a more comfortable size for this trip. The time that we had with the first boat really helped me learn what I’d want in the second one. I’m glad that we’ve owned both, and think this one will stick around for a long time to come. The new boat was in good condition when we bought it and is really dialed in and in great shape now. We left for our trip on July 1st. 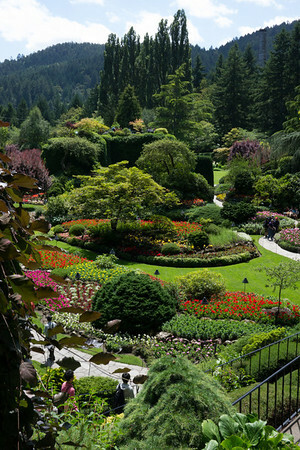 The plan was to move at a swift but not breakneck pace up towards Desolation Sound, with one major break to visit Buchart Gardens near Sidney, BC. This is a very well known garden and we hadn’t been there in 15 years. 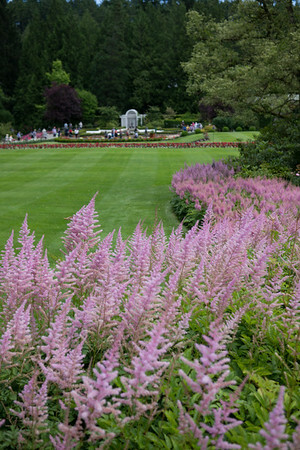 Since Christine works with plants for a living and the garden was accessible by boat it was a must visit. We also ended up with one rest day on our trip north while we waiting for the weather to calm down so we could have a more comfortable passage across the Strait of Georgia. We still ended up crossing the Strait in 20-25 knots of wind with seas of about 4-6 feet in height. The boat did great, but Christine was quite nervous. In total it took us about a week to get to Desolation Sound, with us blowing past most of the San Juan Islands and Gulf Islands. 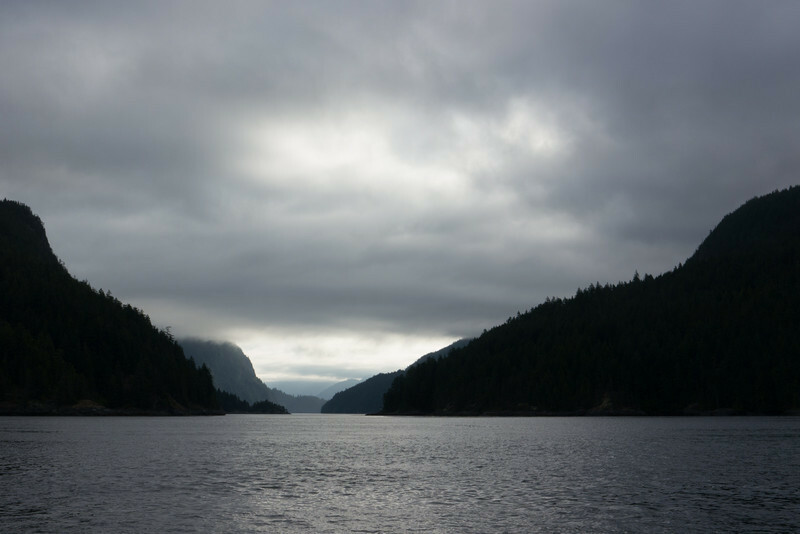 We spent almost two weeks in the Desolation Sound area. This was awesome with fjords everywhere and mountains plunging straight from the sky into the water. There were waterfalls that dumped right into the sea, islands and rocks everywhere to explore, beautiful clean lakes to swim in, and most surprisingly warm clean sea water (the next warmest water south is in Mexico) to swim in too. I’ll let the photos speak for themselves (and click on any of them to drop into a gallery with many more). I don’t think I can name our favorite anchorages, they were all wonderful. 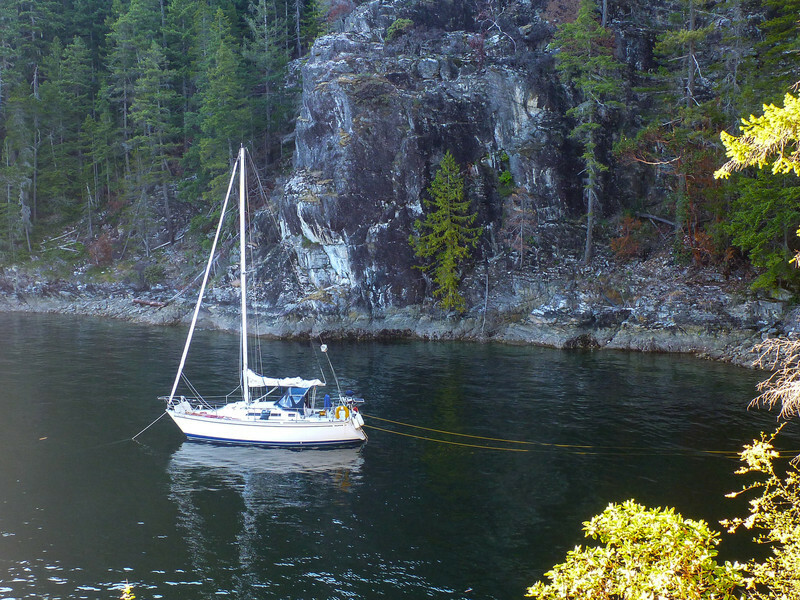 Anchored out in Isabel Cove, Desolation Sound. That is our sailboat in the background and our dinghy in the foreground. 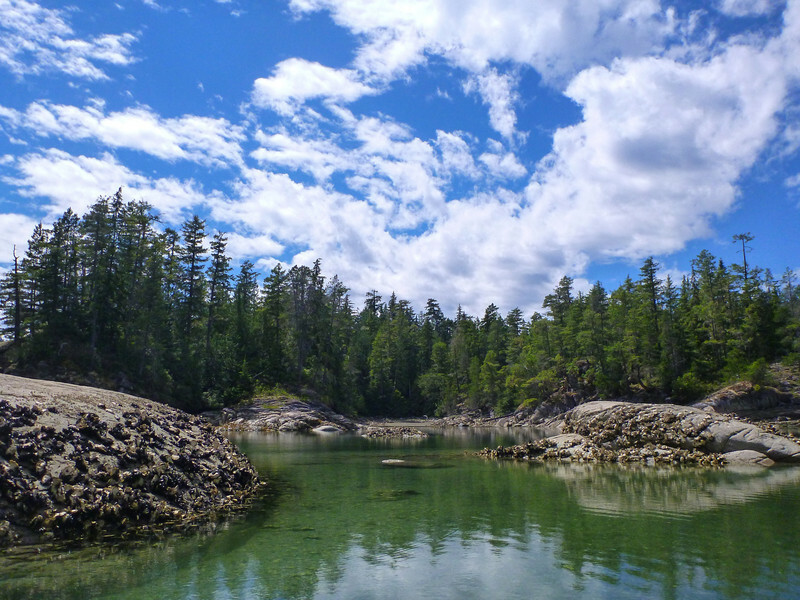 Hiking in Laura Cove, Prideaux Haven, Desolation Sound. 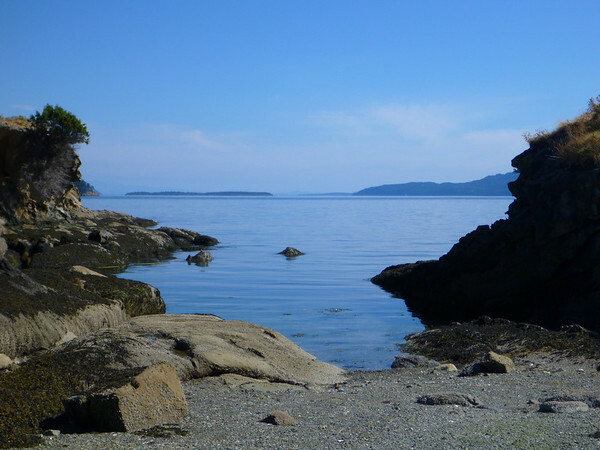 Clear waters, blue skies, awesome scenery in Prideaux Haven. That little white spec is another sailboat for perspective. A rare cloudy day as we head past "Hole in the Wall"
We came home down the western side of the Strait of Georgia in very calm conditions and had to motor most of the time. 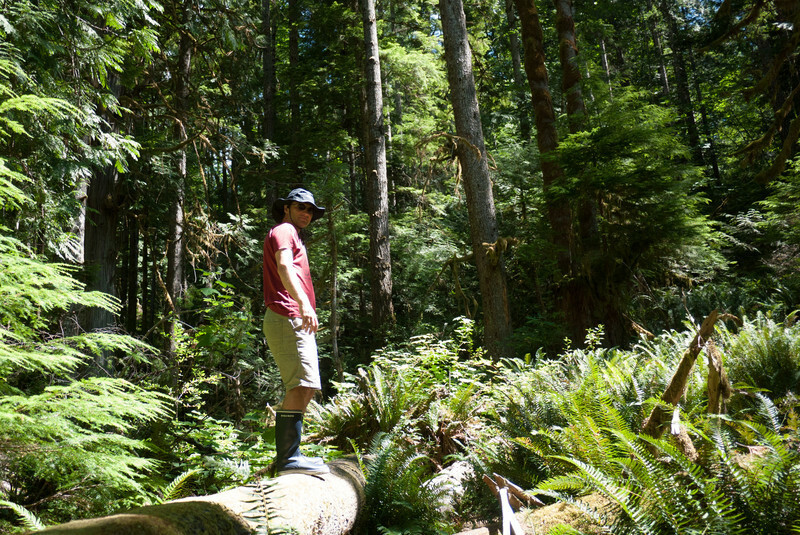 We didn’t leave ourselves a lot of time to explore on our way home and chose to spend what we had in the Gulf Islands. 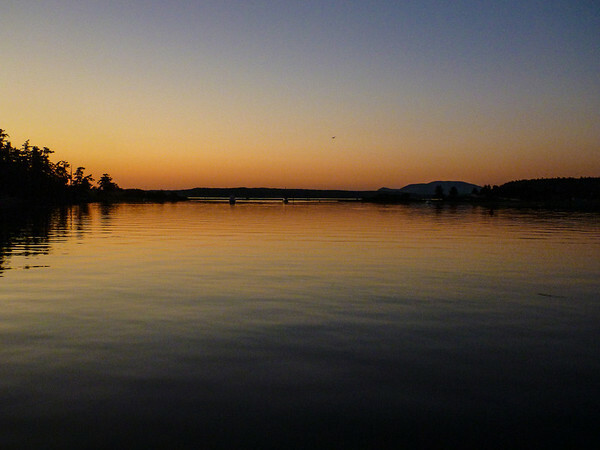 The two days spent on Salt Spring Island where a highlight of the trip. We might some of the nicest people anywhere on that trip, I went for a great bike ride around the island on my Brompton, and ate some great local food too. It was a fitting way to really end the trip. 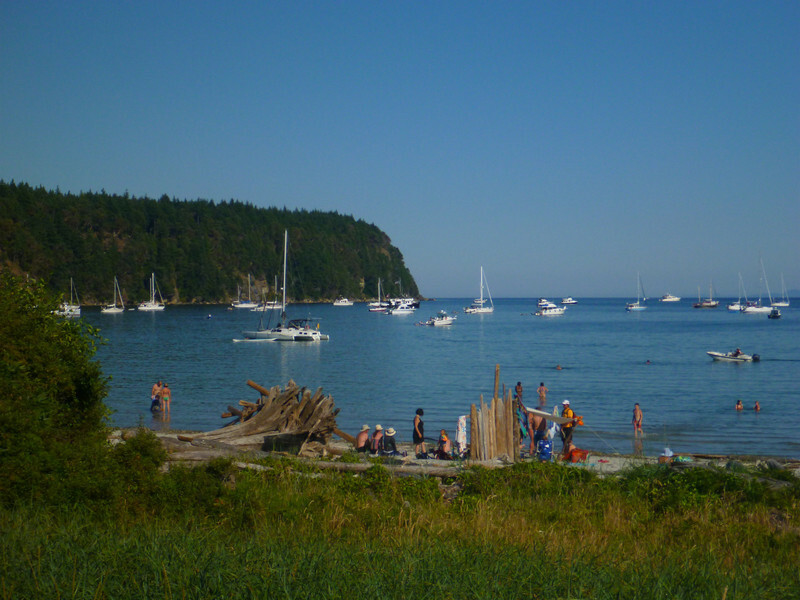 Hornby Island had a great swimming beach, but lots of crowds. We didn't see as much wildlife as we hoped. 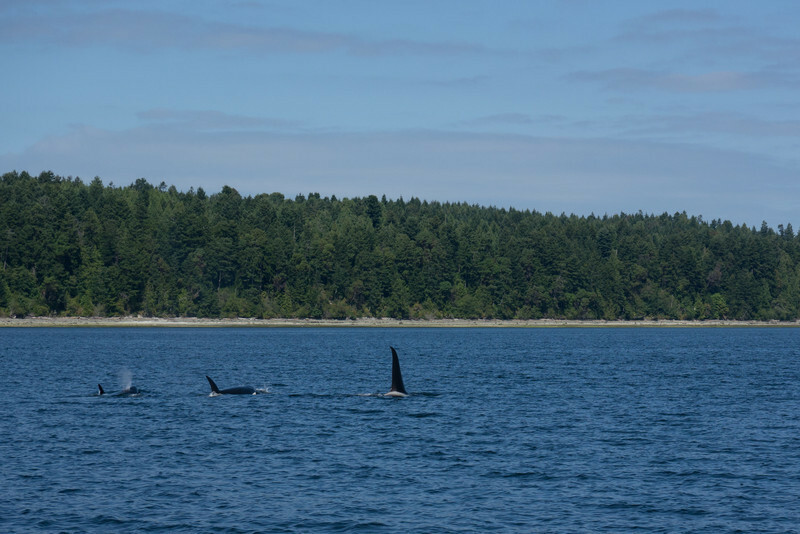 These transient Orca whales were found near Wallace Island. 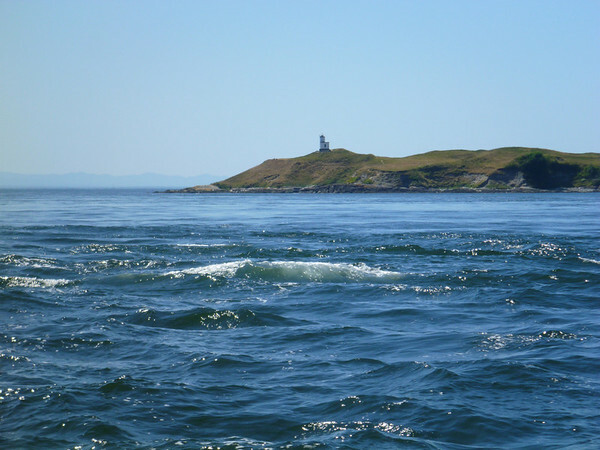 The resident whales are believed to be far offshore this year due to low Chinook salmon stocks in the Salish Sea. A couple of the very friendly folks that we met on Salt Spring Island. 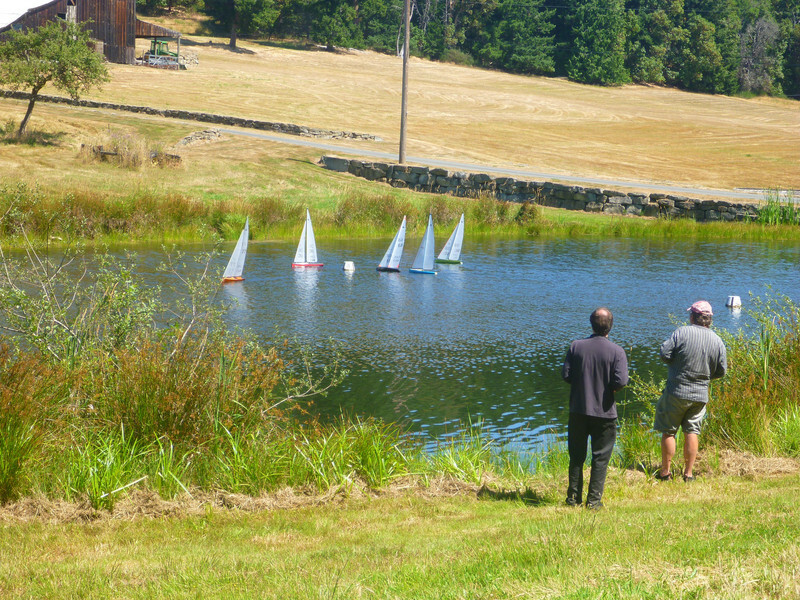 I ran into this group racing remote control sailboats while on a bike ride on the north end of the island. They invited me to try out the small boats and to come race with them on larger boats the next day, but sadly we couldn't stay that long. The rest of the way home was a little bittersweet. I wanted to keep going, Christine wanted to get home and see the cats, and we had things to attend to in Seattle. 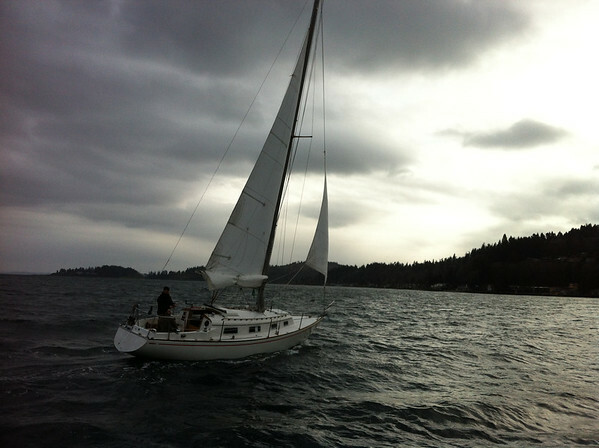 We had a couple of quiet days heading south through Puget Sound and putting the boat away. In September I hope to do another trip. 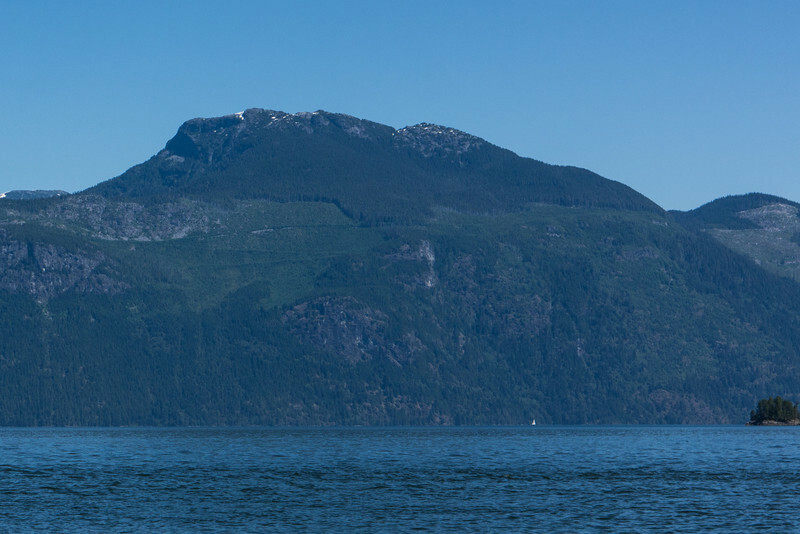 I’m thinking about doing a big adventure and going up to Barkley Sound, or a smaller one and returning to the Gulf Islands. 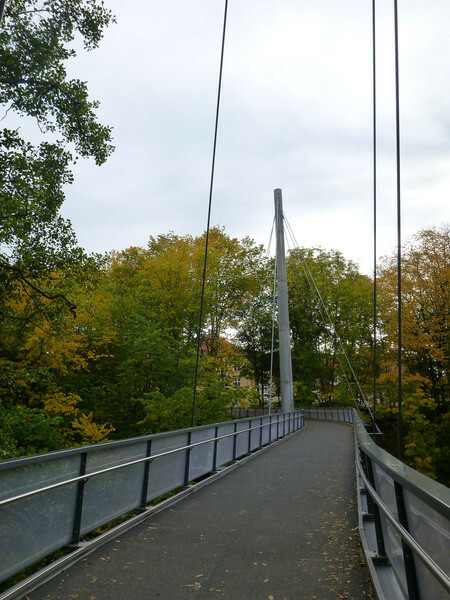 Normally cyclists in Seattle celebrate this weekend by taking the ferry over to Bainbridge Island, riding around it in a loop known as Chilly Hilly, and then coming home. For the last 7 years I’ve taken part in an alternative event called the FHR with my friends at .83, though I do my own variation by exploring the dirt trails in the middle of the island and then meeting up for the after party. Close hauled in 20 knots of wind. Photo by Andrew. This is a short video (click to view it) with a few snapshots of being on the water. Video by Andrew. This year I’ve been excited about sailing and decided to sail there instead, arriving in time for the FHR party. Raz, Andrew, Tatiana, and Theo met me at the marina and we headed out around 9:30am. Winds were forecast to be high, starting around 20 knots (that’s about 24mph or 38kph) and building up as high as 30 knots. I haven’t done a lot of sailing in this much wind, especially on my new boat Elena, a Pearson 28-2. 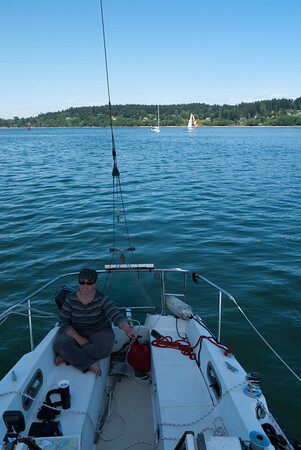 Razi (who has a lot of sailing experience) took the helm as we tacked our way south along Puget Sound to Bainbridge Island. We got to the party around noon, just in time to discover that there was no more chili, but got to say hi to all of our friends and meet up with another few who sailed there too. 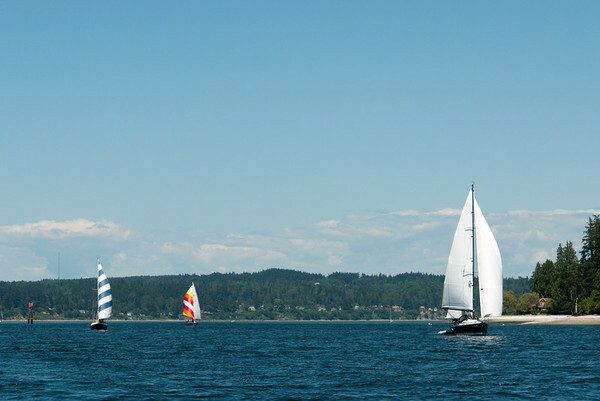 After a beer on the dock and some sailor chat the sailors jumped on their boats and headed back to Shilshole. 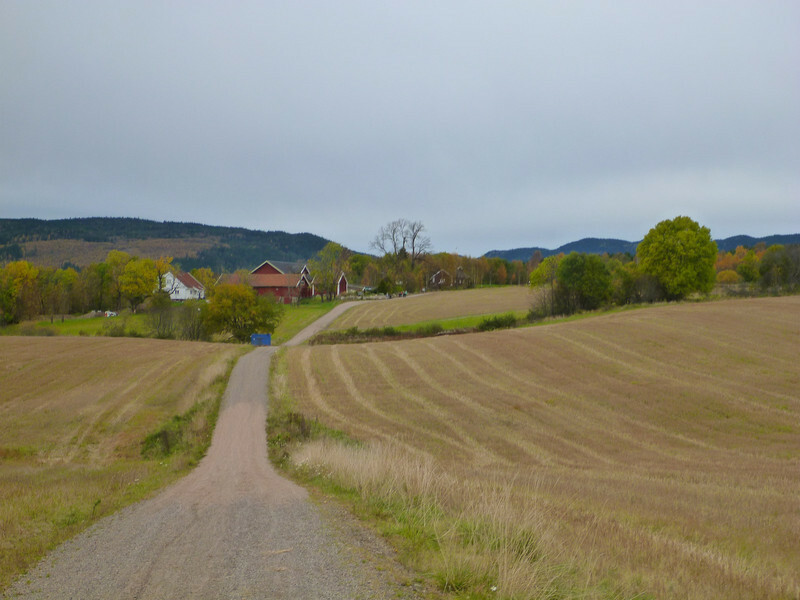 This time the wind was at our backs and the trip back was fast and comfortable. For about half of it we had Jackie, a friend’s Yankee 30 sailboat, just 50′ or so off to starboard. Close enough that we could shout across to each other and get some fun photos and videos. I was nervous about docking in this much wind, but slid the boat back into it’s berth nicely. That's my new boat "Elena", a Pearson 28-2. Sailing out of Eagle Harbor under reduced sail. Photo by Bob. It’s probably obvious to most of my blog readers that I haven’t had much cycling content recently. I’m still really interested in cycling and building bicycles, but the reality is that in the last year I’ve spent a lot more time sailing and working on boats. Today’s sailing instead of cycling reinforced that. 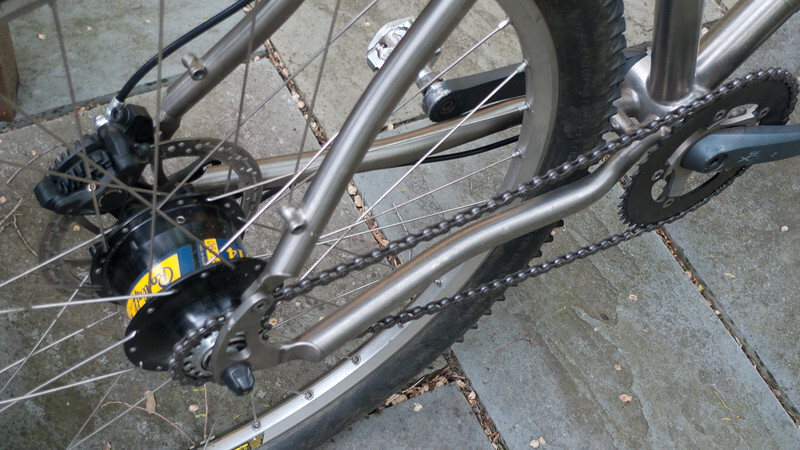 I have big plans for this summer involving sailing (and some cycling), and do expect something of a shift back towards cycling and building bicycles on this blog in the fall. In the meantime stay tuned for a little bit of sailing and a little bit of cycling and not much framebuilding. Christine shot this video on her cellphone. Christine and I were taking a lunch break from cleaning up our sailboat today when I checked the Orca Network Facebook page. The resident pods (normally in the San Juan Islands) have been hanging around Seattle for a couple of weeks eating fresh salmon chum, but we never saw them when we were out on the sailboat. Today was our turn! The most recent post said they were last spotted off of Alki Beach and were heading north. 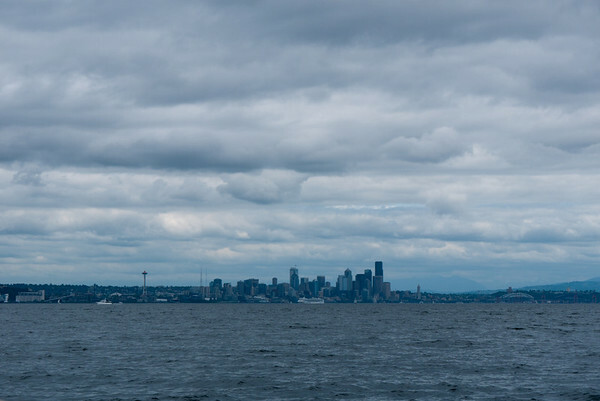 Alki is about an hour’s sail south of us, so we got the boat out of our slip and headed south to find them. I kept an eye on my phone for updates on their location and about the time that someone reported seeing them off of Magnolia we looked over and found them about half a mile away off of our 10 o’clock. I tacked the boat in their direction and slowed until we were a safe distance away (about 200 meters). We hove-to (slows the boat down to a crawl) and floated along side until they’d passed. We then sailed slowly under our main sail, keeping speed with them and going along side the group (always trying to stay the required 100 meters away). It was magical when we were out there alone, just us an the Orcas, and no sounds but them breathing. The silence was broken for a few minutes as another sailboat came motoring past and then crowded into them, but eventually he turned off his motor and sailed along with us too. When the second part of the video was shot it was hard to stay the safe distance away. The group had split suddenly and most of them went in between our boat and the other one. As we tried to move away from them (you can hear Christine asking me why I’m sailing away from them at 1:45 in the video) the other part of the pod started to surface on our starboard side. I slowed the boat even further to let them pass before we headed back. It was an amazing hour of watching the Orcas. It’s time to start leaving a decent older digital camera on the sailboat, this cellphone footage isn’t great (especially from using the digital zoom), but it’s what we’ve got. 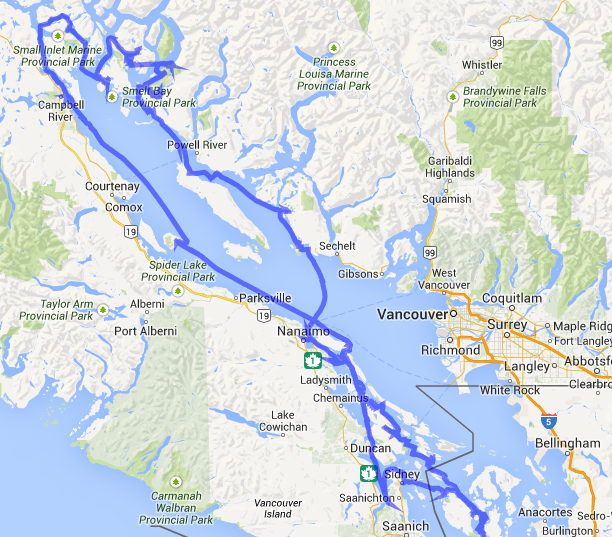 This summer’s big vacation was a sailing trip from to Seattle, up to the San Juan Islands, and back to Seattle. I took two weeks off of work and used 11 days of that time for the trip. The text is long, but I’m mixing in a lot of annotated photos if you want to read along that way. You can also find large versions of the photos on our smugmug gallery of the trip. 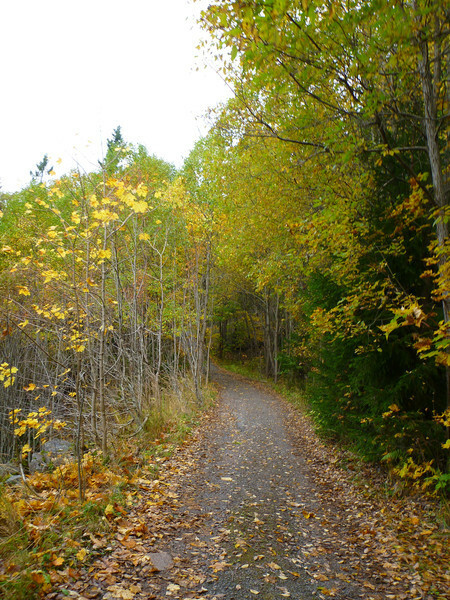 Dear bike nerds who enjoy my normal content: Fall is coming and I’ll be back in the basement and working on fun projects soon. I hope you don’t mind this little bit of sailing in the meantime. 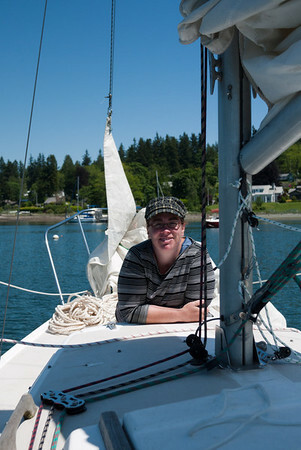 My friend Andrew joined me for the trip north to the San Juan Islands. Christine couldn’t get the time off of work and Andrew has been sailing with me a lot this summer. 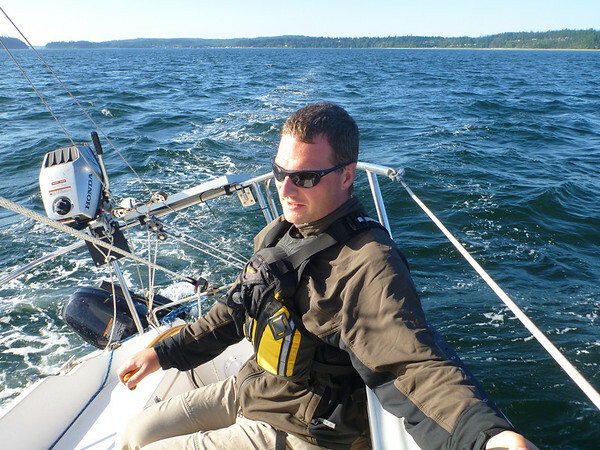 We left Shilshole Marina in Ballard (north Seattle) at about 5:30pm and sailed then motored to a little bit north of Kingston, WA. Rather than doing the logical thing of anchoring at Apple Tree Cove in Kingston I pushed on and we anchored about 4 or 5 miles north. This wasn’t well protected, but the winds were calm and we planned on waking up early. We made a quick dinner and got to bed just before midnight. I didn’t sleep that well that night due to being nervous about our anchoring and anxious to get on with the trip. I knew that we had to start moving early to catch the tides properly to take advantage of the currents. At about 5am I woke up and hauled anchor and tried to motor quietly to avoid waking Andrew. Running a small outboard at 5:30am will wake up anyone, so a few minutes later he joined me and the trip started in earnest. There were large waves in Admirality Inlet, so we ducked over to the canal near Oak Bay. 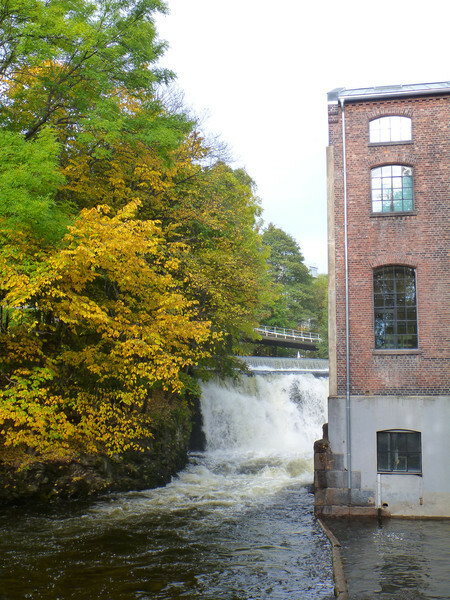 We used the protected waters there to make some coffee, headed through the canal, and then raised sail. 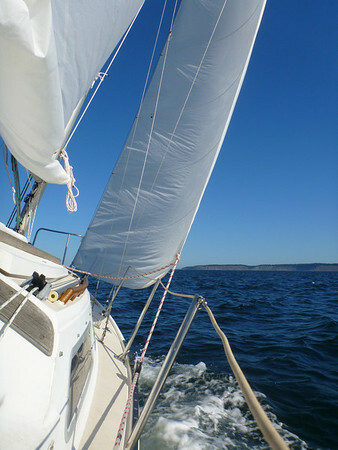 During this time I had been texting with my friend Matt who was a couple of hours ahead of us and he warned that winds were high near Port Townsend and that we should reef our sails (that is shrinking the sails to handle high winds). Andrew and I took turns at the helm on our first long day of sailing (75 miles in 13 hours). This was during one of my turns. Conditions were dynamic enough that I didn't use the autopilot much. 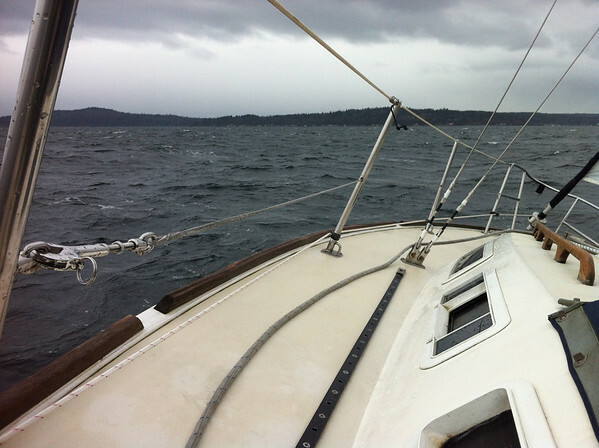 Being reefed near Port Townsend wasn’t necessary, but it also didn’t slow us down too much. 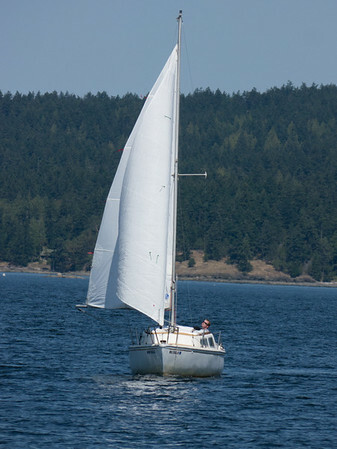 Once we got past Port Townsend and into the Strait of Juan de Fuca Matt’s advice was really beneficial, we were flying along with our smallest jib and the main reefed. My sailboat can’t go faster than about 6 knots through water and we were going just about that fast without much advantage from the currents. 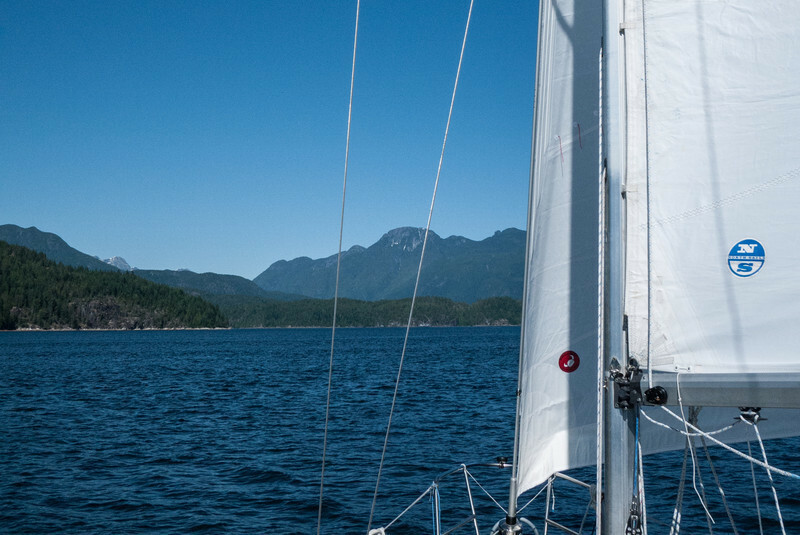 The trip across the Strait went pretty quickly as a result, the winds did die down somewhere in the middle and we raised the rest of the main sail to compensate. 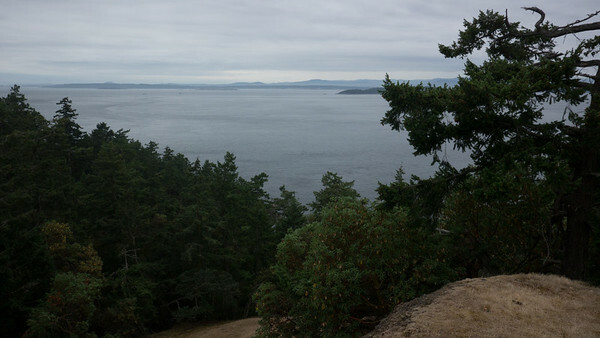 We entered the San Juan Islands by going up Cattle Pass between Lopez Island and San Juan Island. In this area someone suddenly turned off the wind and we came across a large group of whale watching boats. We tried to find the whales ourselves while sailing slowing between the boats, but never did see anything. Just as the last whale watching boats moved away the wind picked up and we entered Cattle Pass. 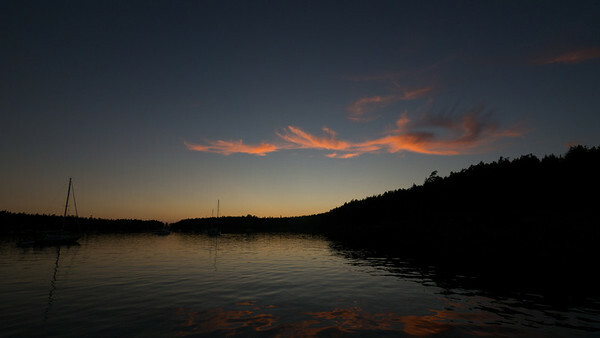 We also were talking to Matt and picked Westsound (on Orcas Island) as a good destination for both of us for the night. 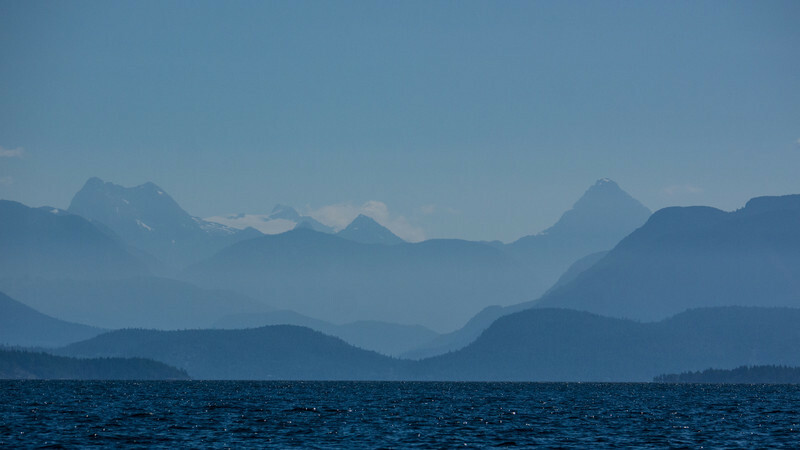 The amazing thing is that it was only 1pm, and I hadn’t expected to be actually sailing in the San Juans until 4 or 5 hours later! Our arrival in the San Juans was near American Camp on San Juan Island. We got there just in time for the water to froth up with strong currents and pull us up towards our destination. 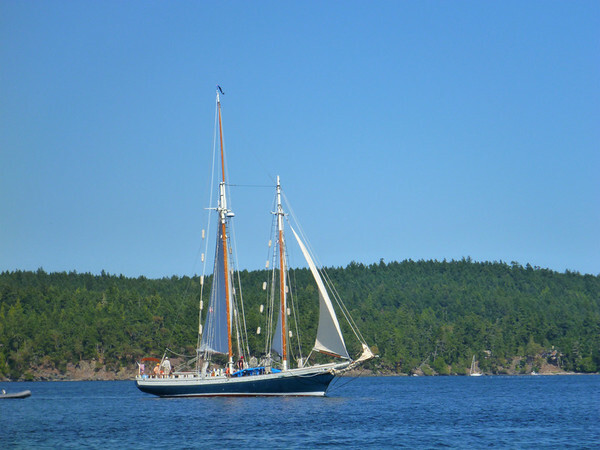 A group of 3 or 4 wooden schooners were sailing around Shaw Island as we sailed by. It was really enjoyable to see all of them with their sails flying. We got to Cattle Pass near the peak currents and were quickly whisked in on a greater than 3 knot current, bringing our speed up to over 8 knots sustained and peaking over 9 knots. Not only were we ahead of schedule, but we were picking up speed and time. I’d never had our little sailboat running this fast! 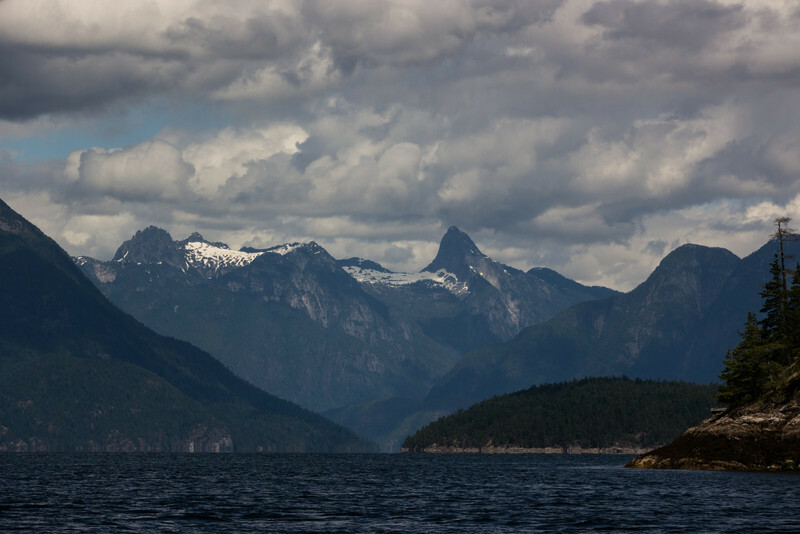 It didn’t take long before we found ourselves going around the north end of Shaw Island and heading up to West Sound. The winds died off north of Shaw, but we sailing slowly and drifted with the currents for almost an hour before putting in the motor and heading up to meet Matt. Just over 24 hours from leaving Shilshole we were docked on Orcas Island, almost a day ahead of schedule! On Wednesday we’d covered 74 miles in 13 hours, the longest day by far that either of us had spent sailing. On Thursday morning we had a lazy breakfast, cleaned up the chaos on the boat, and then I took Andrew down to Orcas Landing. The plan was to drop Andrew off there and pick up Christine who was taking the ferry in. I loved seeing the variety of cool boats that were going around in the San Juans. I don't really know what was going on with this boat, but I think it had something to do with tiring out a group of summer camp kids. We saw this near Orcas Island as we entered Westsound. In the San Juans we ran into Matt on his sailboat Karma a few times. He is a friend who also keeps his boat on Lake Union, and it was nice to run into a familiar face up here. 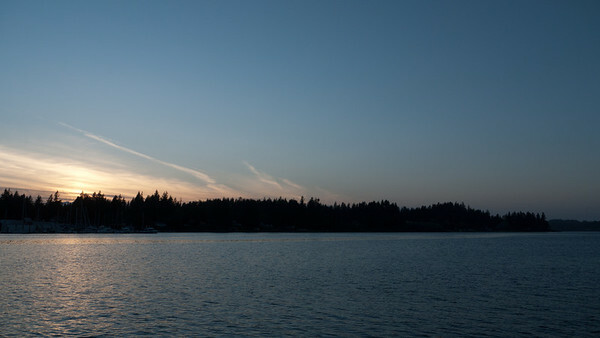 When I got back to the boat after picking up Christine I discovered the downside of the Orcas Landing public dock. It is really exposed! Our boat had been bouncing up and down enough that some of the fenders (the bumpers that protect the boat from the dock) had been pulled off. Most landed on the boat, but one was missing. I looked over and saw it bobbing around on a nearby beach, so I got in the dinghy and motored over there. I saved the fender just fine, but while turning around I ran our dinghy motor into a rock and broke the shear pin that holds the motor’s propeller in place. Thankfully Christine found some nice folks who towed me back over to our boat (and I had a spare prop). 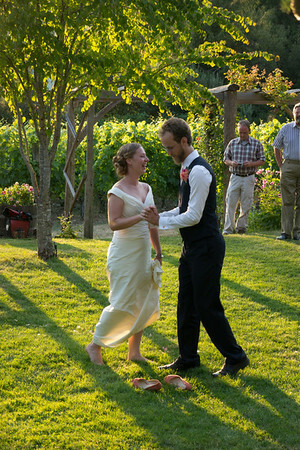 We stayed on Lopez Island for a couple of nights to go to Kalen and Clair's wedding. Fisherman's Bay has beautiful sunsets. This one occured on Christine's first night in the islands (after Andrew headed home). Kalen and Clair had one of the most fun and beautiful weddings that I've been to in a long time. Congrats guys! 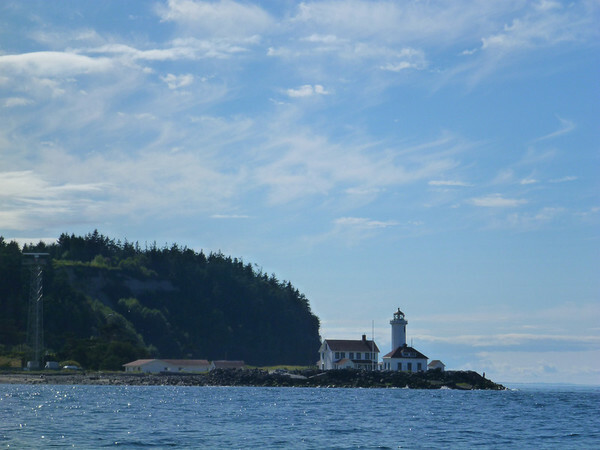 We spent our first couple of days in the San Juans staying at Islands Marine Center on Lopez Island. Some friends of ours were getting married at the Lopez Island Winery, and we enjoyed a couple of days hanging out with our friends there and going to a fantastic wedding. Some of our friends there also sailed, so we talked to them to get ideas for where to go during the rest of our trip. 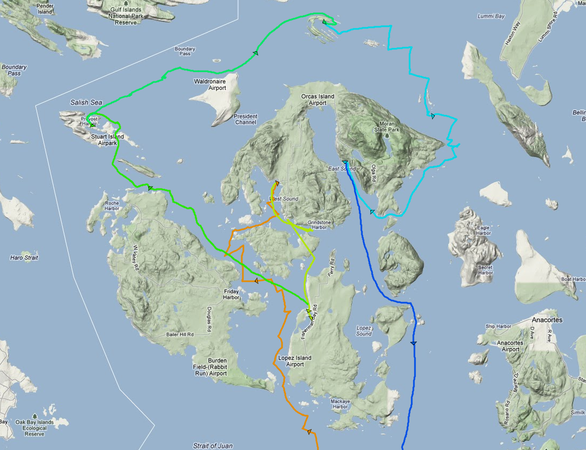 We ended up with a rough plan to circle Orcas Island clockwise and stop at some of the outer islands that aren’t accessible by ferry. The morning after the wedding we packed up our gear, bought ice and fuel for the boat, and sailed up to Stuart Island. The sailing to Stuart was pretty easy (except for 30 minutes where I tangled up the spinnaker) and we enjoyed looking at the scenery along the way. Stuart Island has two bays, one to the north (Provost Harbor) and one to the south (Ried Harbor), and we headed to the north one to avoid potentially bad weather that was coming in from the south. 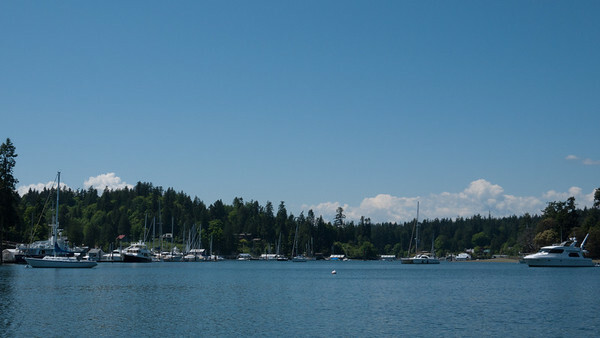 This turned out to be a good decision, Provost Harbor had much less boat traffic and was a lot quieter. We picked a good location and dropped anchor. After dinner our friend Matt (from a few days earlier) turned up and we enjoyed some drinks and cheese with them on their boat until nightfall. Catching kelp trains on our rudder seemed like about the biggest danger that we had in the islands. 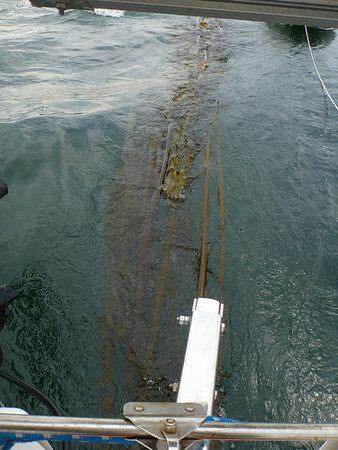 30' of kelp trailing behind a sailboat can really wreck how it handles. Stuart Island had some interesting sounds sights to visit, so we stayed for a full rest day and went for a hike. The first stop was a museum at a still active single room schoolhouse that had been there for over 100 years. In many years they only had a couple of students, and the schoolhouse included photos from most of the classes that have graduated there. It was really fun reading about the history of the place and we bought some handprinted postcards from there to mail back to family. 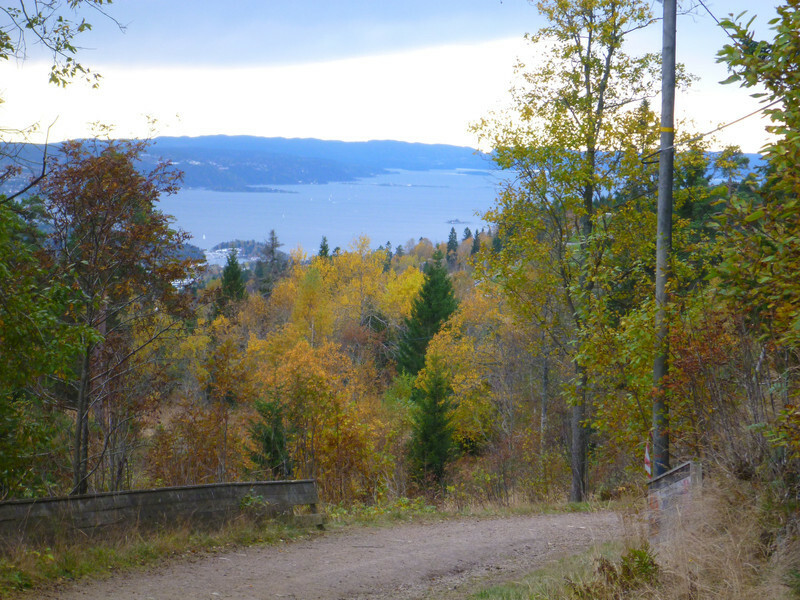 From the school we kept hiking over to the lighthouse at the end of the island. Along the way we stopped at a nice lookout and ate lunch. While there we saw the whale watching boats again, but this time we were able to spot the whales too! We were probably sitting a half a mile away, but we’d brought the binoculars and enjoyed the show. When it was over we walked down to the lighthouse and then took an alternative (and it turned out not to really be public) route back by a modern totem pole. 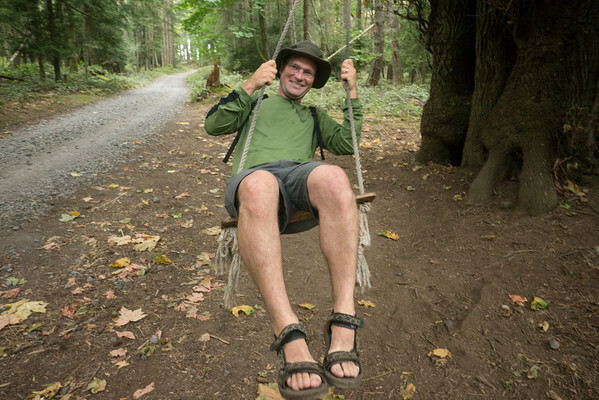 A tree swing that we found alongside a road (mostly used by pedestrians) on Stuart Island. It was a lot of fun! 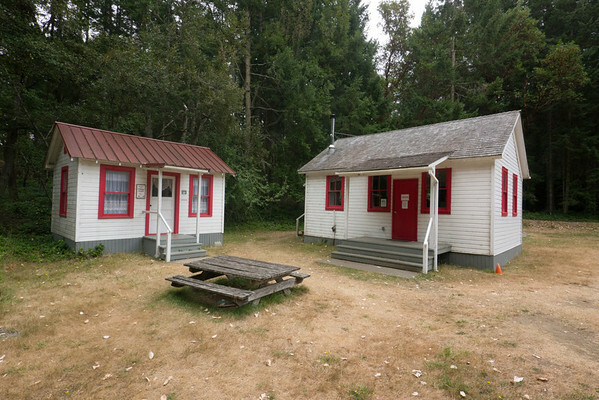 Stuart Island has this 100 year old schoolhouse (one building for school, one for a library) as a museum with the island's history. It was fascinating and very cute. There are only about 15-20 people who live on this island year round, but it has two museums, the other at a lighthouse. We enjoyed the view from this lookout on the west end of Stuart Island. I'm glad that we packed along good binoculars, because we saw a group of Orca whales go by! 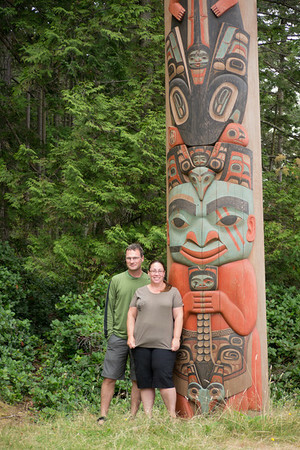 After the lighthouse museum we came back a different way past this totem pole. 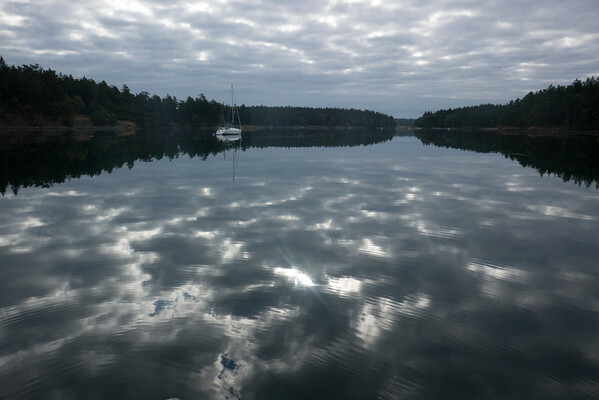 The next morning we pulled anchor and started going northwest towards Sucia Island. 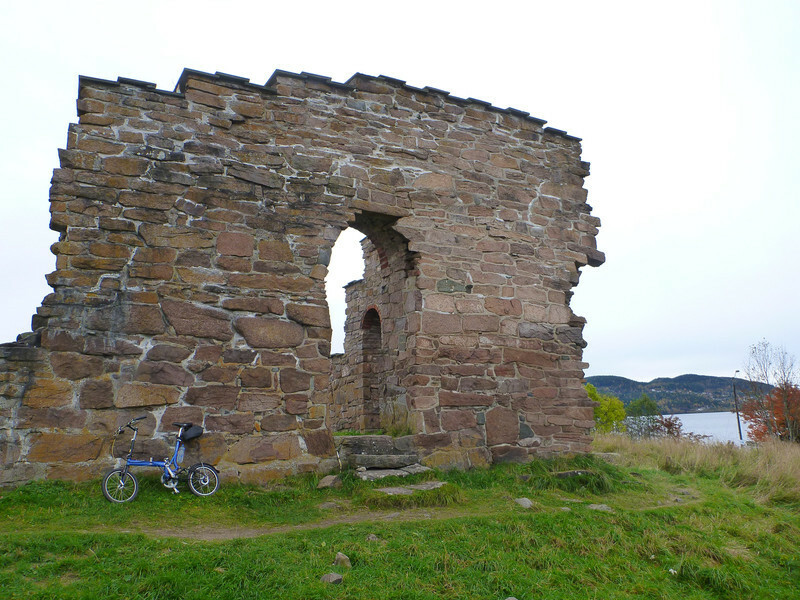 The winds were really light so we didn’t go very quickly, but we also didn’t need to go very far. 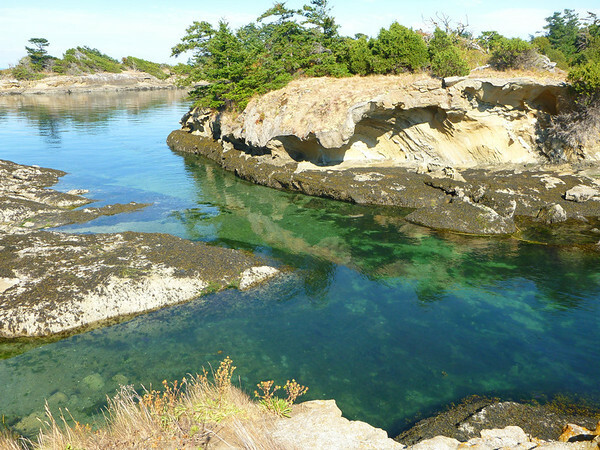 Sucia Island was one of the most intriguing destinations on the map because it just looks so unusual. 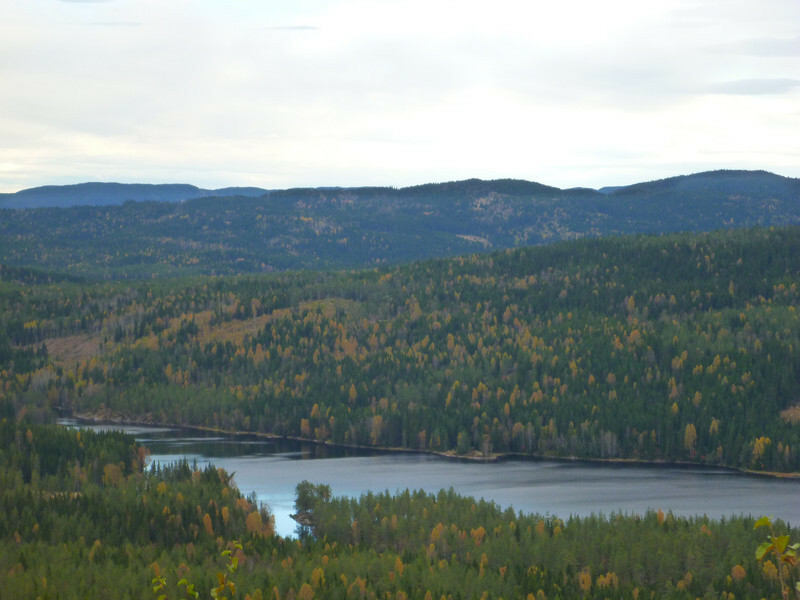 We discovered that the topography up close was just as dramatic and interesting as the island’s shape on the map. We were really drawn to an area called Ewing Cove. All of the mooring balls there were in use, but we went around the corner into Echo Bay and looked for a place to anchor. While anchoring Christine noticed 3 otters that had caught a fish running up the limestone cliffs with their prey in tow. We watched them for a bit before moving along. After anchoring we got back in the dinghy to go on long at Ewing Cove. This area had many little islands that you could walk across during the low tide. We hiked and explored for a couple of hours before going back to the boat for an on-deck shower and a nice dinner. We finished the evening with a beautiful sunset. Our last morning anchored by Stuart Island before heading east to Sucia Island. 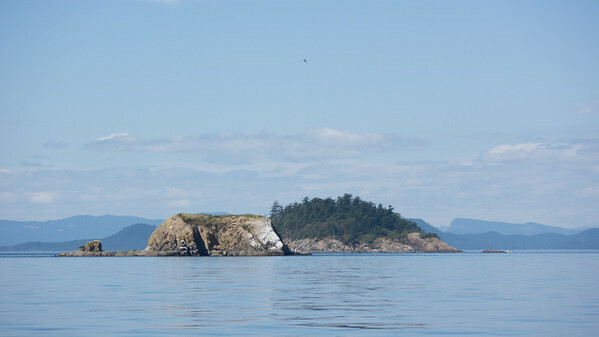 The sailing to Sucia Island was calm and slow and enjoyable. We were sailing along the Strait of Georgia and passed many small islands, including these two (Skipjack and Bare) that act as a wildlife preserve. 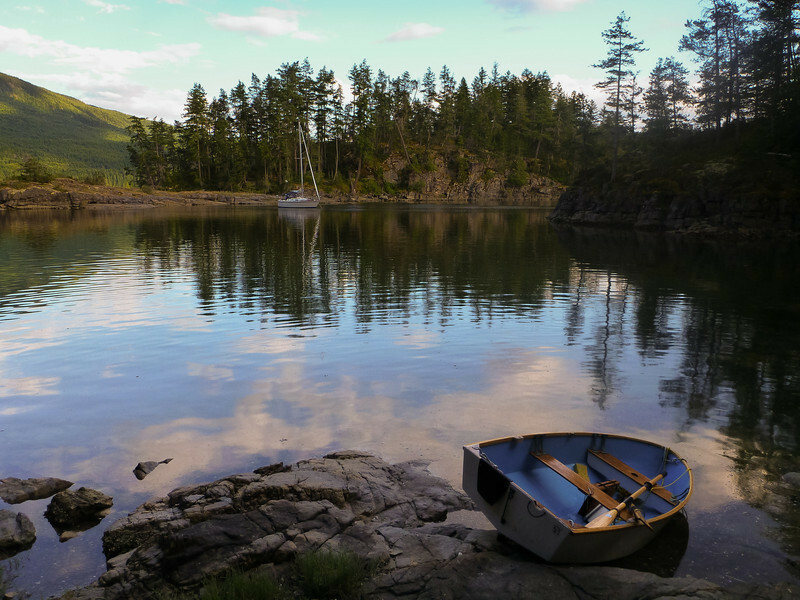 Ewing Cove was our favorite spot on Sucia Island. We couldn't anchor there (it's small and was already full), but went back on our dinghy to explore. More cool boats seen in the San Juans. 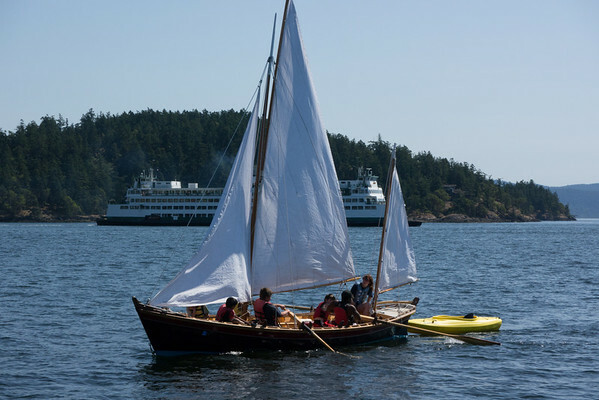 This group had come over from Bellingham, and I think there were 5 of them and a dog aboard this small yawl. The small and low draft boat let them anchor in the best spot near Ewing without worries of hitting anything. Another beautiful boat that we kept seeing in the San Juans. 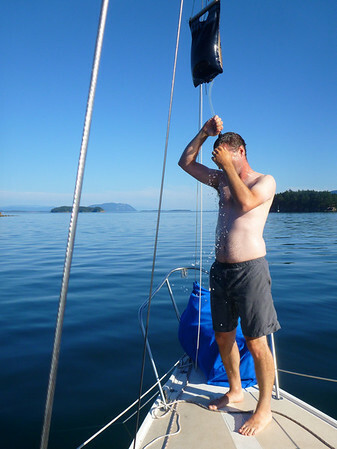 We used a solar shower hanging from the jib halyard to take a nice warm shower after 3 days of anchoring out. 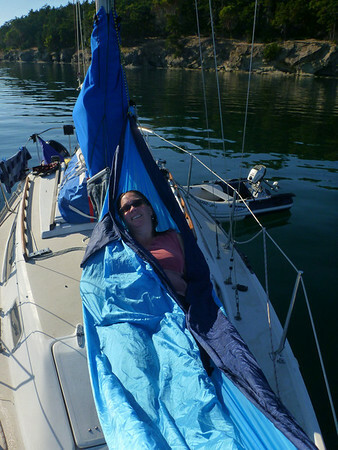 We also figured out a good way to rig up a hammock on the bow of the boat. It's really relaxing up there, the only problem is that we can't fit two of them! On Tuesday we woke up to cooler air, good winds out of the southeast, and a little more grey then we’d been hoping for. 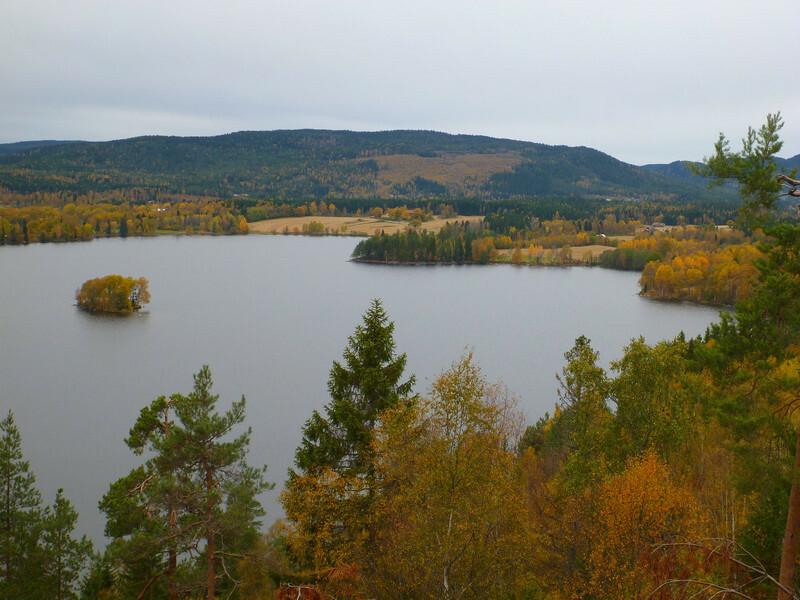 It was our 13th wedding anniversary and we’d been trying to decide if we should stay on Sucia and go for a hike, or sail south to look for a nice marina with a restaurant. 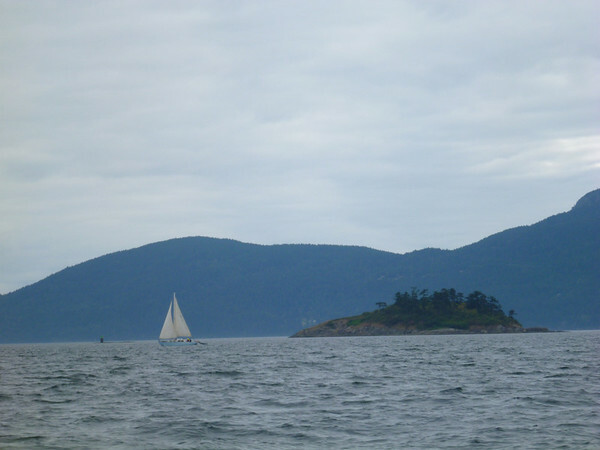 The weather helped us make up our mind, and we set sail for Rosario Resort back on Orcas Island. 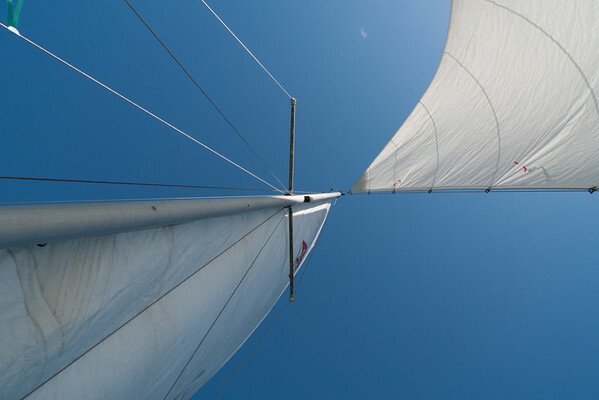 We had to sail directly into the wind, which meant tacking (zig zagging) back and forth, not the most efficient way to go. I was enjoying the sailing though, the winds were great and there were some other boats to race against and check out. 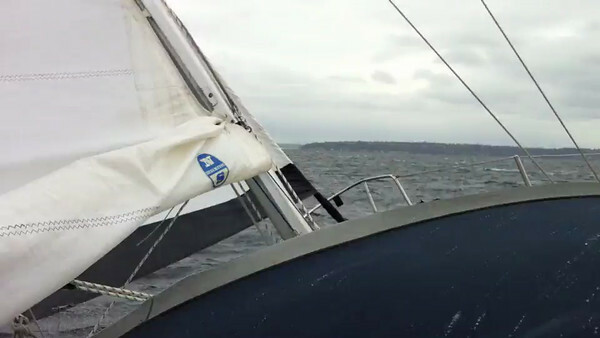 The wind got a little strong near Clarke and Barnes Islands, but we ducked in between them and found better conditions. We were running fairly slow though, and were at risk of both missing favorable currents and coming in too late for our dinner reservation. 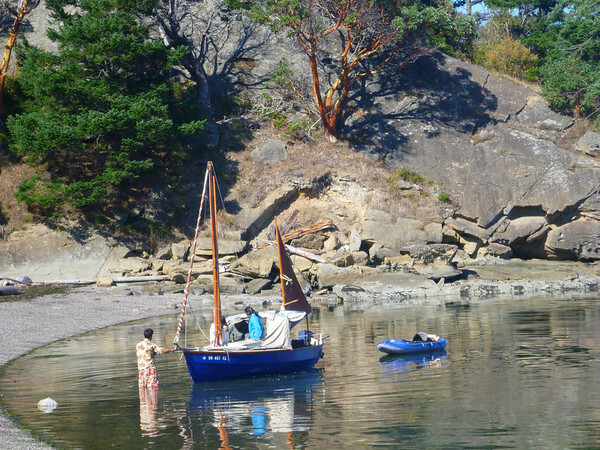 Once we passed the eastern most point on Orcas Island we relented and switched from sailing to motoring. As we went through Obstruction Pass and rounded the bend heading up to Rosario Resort the sun came down and the temperatures rose. We got a nice slip at the marina, enjoyed real showers (the first ones in a few days) and a fantastic dinner. It really was a nice way to spend our anniversary. 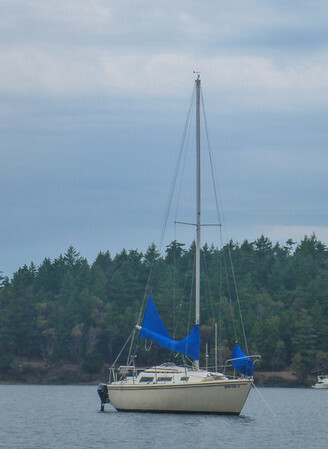 The day that we left Sucia Island was a bit windier, cooler, and grey. We sailed into a headwind most of the day, so progress was a little slow. 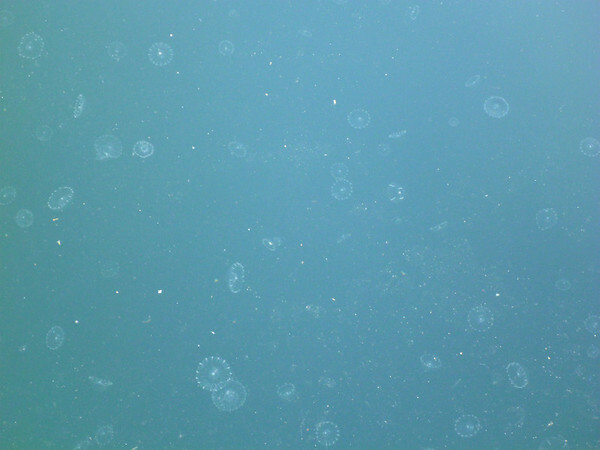 Rosario Resort's docks were full of these tiny little jellyfish. We didn't go swimming, but we did have a fun time watching a young kid catch hundreds of them in a net. Of course I neglected to take a photo of the beautiful buildings at Rosario, you'll just have to trust me that they exist. Sadly this was also our last day in the San Juans. The next morning we had to start heading back towards Seattle. We planned for our first stop on the way home to be at Port Townsend. 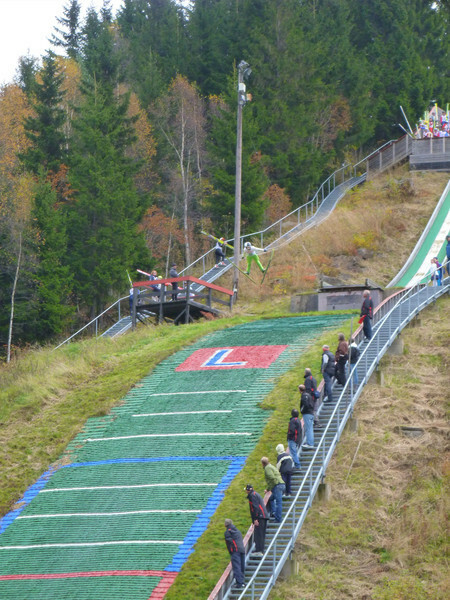 From there we’d try to get the rest of the way home in one day or two depending on conditions and how we were feeling. 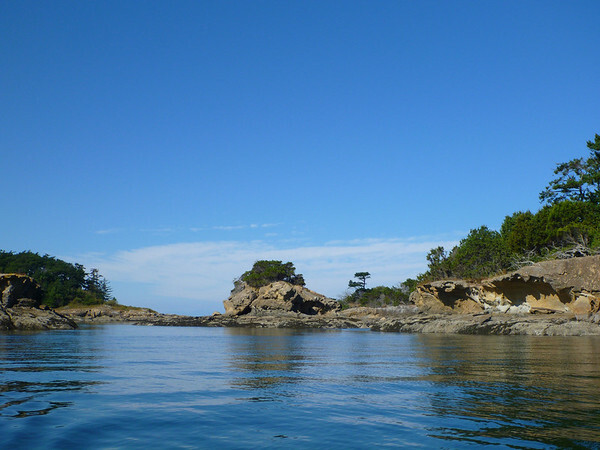 We left Orcas around 10am (any longer and we’d have missed the currents) and motored out of East Sound and along the edge of Lopez Island. I was hoping that we’d pick up some wind in the Strait of Juan de Fuca, but it stayed glassy calm all day. The only sailing occured when a piece of kelp got caught up in our motor’s prop and I had to clear it. We put up sail while I attacked the kelp with a fork duck taped to the end of a boat hook, finally untangling it and allowing our outboard to run freely again. We really need to be better at watching out for kelp, it can really make a mess when it tangles up in the rudder or motor. It was very very calm on our way south across the Strait of Juan de Fuca. We motored almost the entire way as a result. Point Wilson lighthouse. This meant we were really out of the San Juans and almost at Port Townsend. The crossing went pretty quickly and we arrived in Port Towsend in the mid-afternoon. 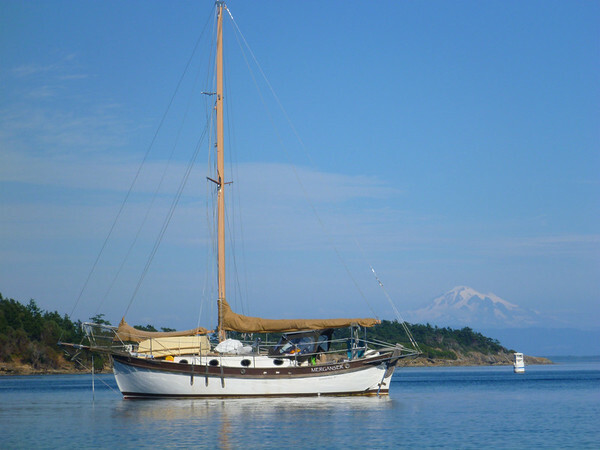 We choose to stay at Port Hudson Marina which is only a few blocks from downtown Port Townsend. Christine and I took some alone time and each did our own things for a couple of hours, then met back at the boat for a nice dinner and an early night in bed. I choose to go for a long brisk walk up to the other marina (a mile or so south of downtown), walk around among the boats, and come back. The next morning the wind was coming strongly out of the west. It was so strong that I skipped an almost necessary stop at the service dock in the marina to empty our boat’s holding tank. The water just outside of the marina had 3′ wind waves, the highest that Christine had ever experienced. The wind was at a pace that would have been nice for sailing, but the waves made me want to get us around the edge of Marrowstone Island where the water was better sheltered and the winds would die down. Once there we put up the spinnaker only for some easy downwind sailing. The next day the wind picked up (a lot! ), but we lost the beautiful blue skies. We flew the spinnaker while getting chased by dark clouds down Admirality Inlet. 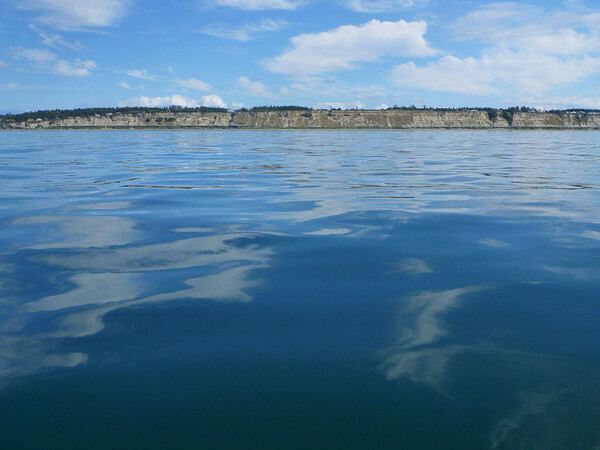 We made the mistake of leaving Port Townsend a little later than we should have and were running a bit late to catch all of the currents. 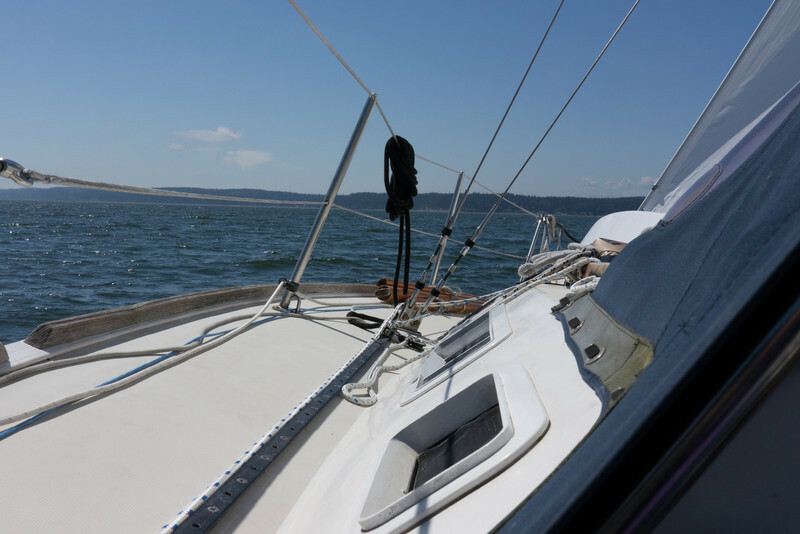 By the time we got 10 miles south of Port Townsend we had a 2 knot current against us and a strong tailwind pushing our boat as fast as it could go (which is a slow 4 knots with the water against us). The winds and current were also opposing which made for shorter and steeper waves. 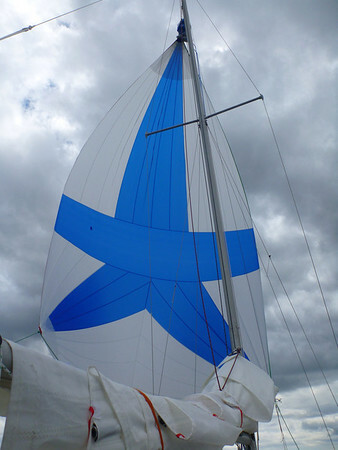 Our asymmetrical spinnaker is happiest on a broad reach, not dead down wind, so I was trying to manage that without making our route too much longer. On top of that a grey cloudbank was following us down Admirality Inlet, making it colder than was ideal. Christine was already feeling anxious from the waves earlier in the day and this weather wasn’t helping. We decided to stop at the first available marina (Kingston) and to motor there instead of continuing to sail the spinnaker. At about 4pm we arrived in Kingston. The harbor there is very well protected and the sun was coming out, really improving our moods. We fueled up, cleaned up the boat, and walked into town for dinner. At dinner we kept hearing the locals talking about something called “Pie in the Park” and finally asked our waitress about it. “Pie in the Park” turned out to be the perfect event to turn our mood around, it was a pie auction and fundraiser taking place a couple of blocks away. For a small donation we bought tastes of many pies and all of the ice cream we could eat (it was melting faster than people were consuming it). We enjoyed hanging out there for an hour watching local business owners buy pies at outrageous prices from local citizens all for helping grow the downtown community. It’s really one of the most fun and nicest fundraisers that I’ve ever been to, and was a perfect way to cap off the day and trip. 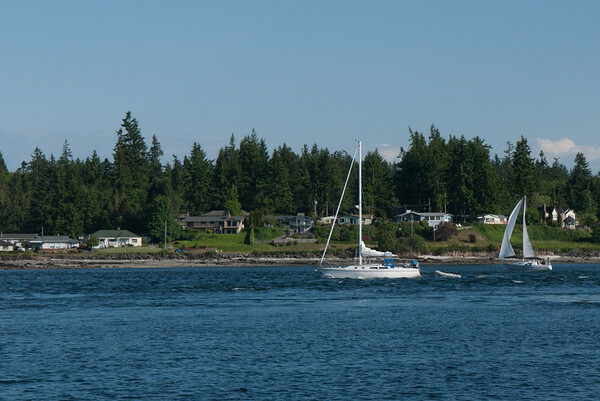 On our final day from Kingston back to Seattle we had clear skies and light winds again (but we did sail). 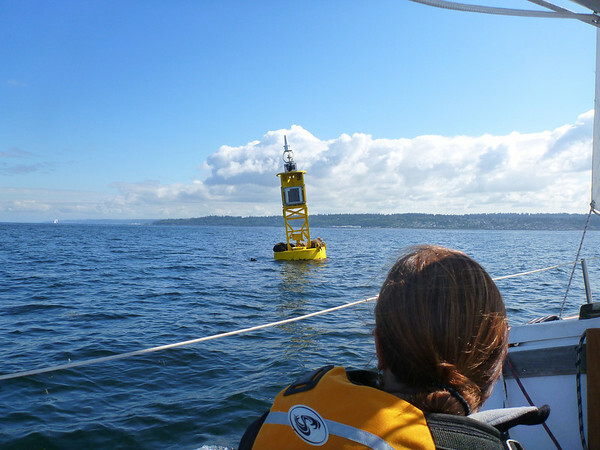 The sea lions loved this bouy marking the center of the shipping lane. The next morning we woke up to light winds out of the south and bright sun. The sail back from Kingston to Shilshole and the locks was extremely pleasant and helped remind us why we like sailing so much. Halfway across we passed a large bouy with 3 sea lions jockeying with each other for the two sea lion sized spots available on the bouy. They completely ignored us as we sailed by and smiled at them. 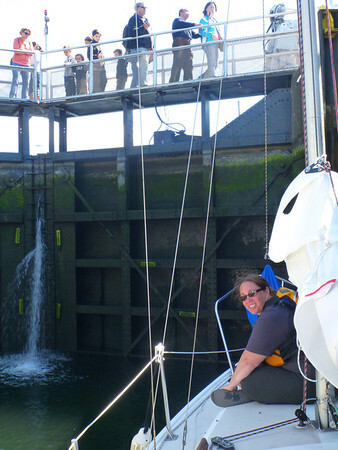 The last part of our trip was going through the locks, something that we normally don’t enjoy too much. 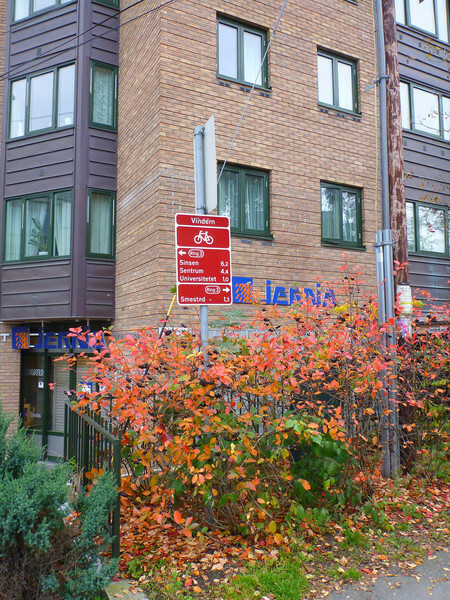 On this calm and sunny Friday afternoon there was almost no wait and we were back at home just after lunch time. 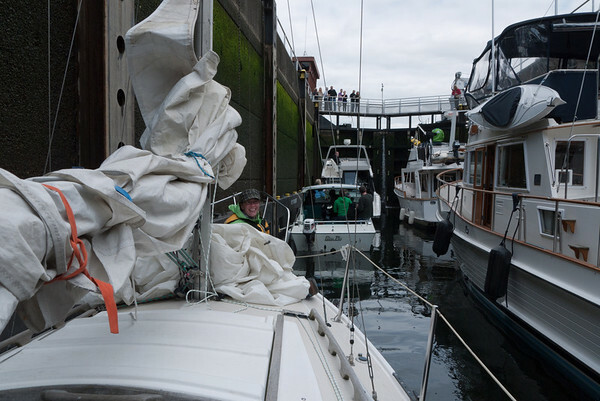 Heading through the locks back to our boat’s homeport on Lake Union. The blog’s been quiet recently because I’ve been busy with my new hobby: sailing (I’ve also been busy at work). 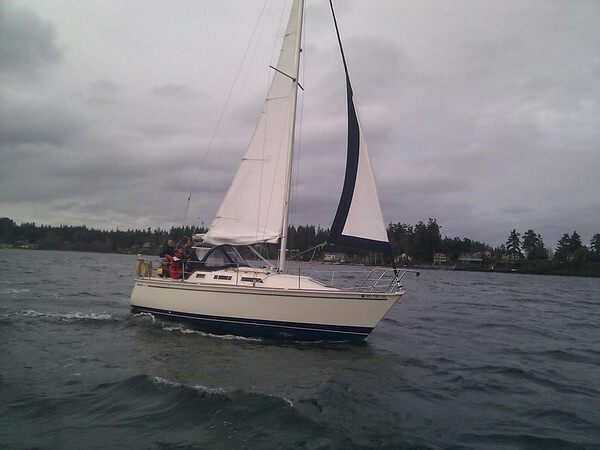 About 6 weeks ago Christine and I bought a 1984 Catalina 25 sailboat. Since then I’ve been spending a lot of time down at the dock doing repairs, cleaning (which seemed to be neglected for the last few years), upgrades, and of course, sailing. 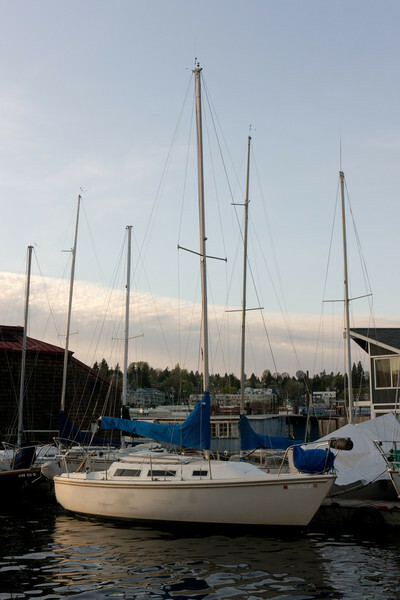 1984 Catalina 25 with a tall mast and fin keel. We've named her "Lutra". The boat isn't a brown as it looks in this photo, it was just taken close to dusk. I’ve always been intrigued by sailing since having a few day introduction to it in high school from a family friend. I’m excited about the possibilities for slow and low impact travel (like cycling and kayaking), but with a bit more of the creature comforts of home. We hope to take it up to the San Juans this summer, and farther north the following summer. 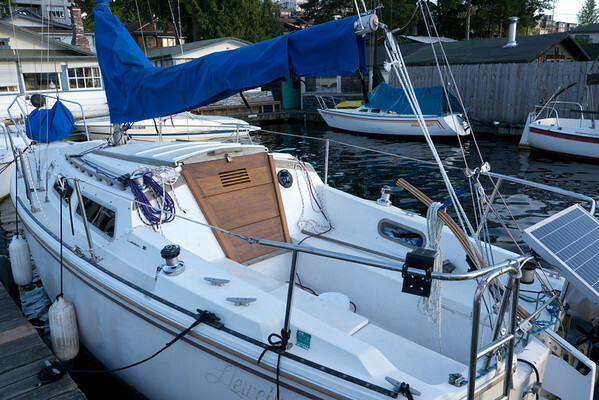 We both started with close to zero experience, so before buying a boat we took sailing classes at The Center for Wooden Boats. 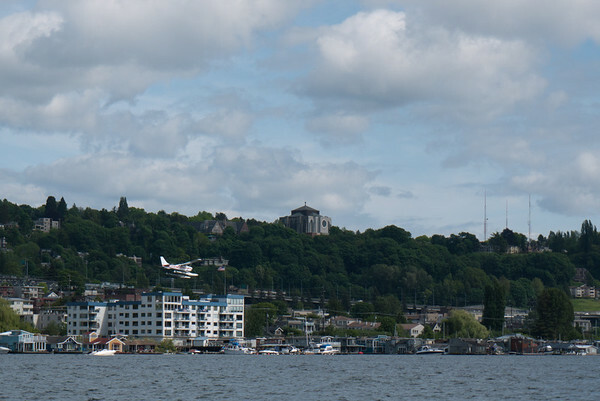 Our instructor was great, the boats that they teach on were great, and the setting (Lake Union in downtown Seattle), was also great. Christine completing her checkout sail at The Center for Wooden Boats. That's on a 20' Blanchard Knockabout, not our boat. We picked this boat because it’s small enough for us to handle comfortably, but large enough for us to sleep on. 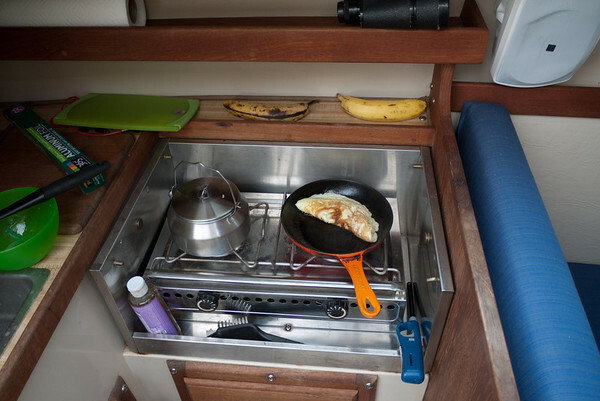 The interior has a main cabin with a little dinette and galley (kitchen), a tiny little head (bathroom), and then a front vee-berth that we can both fit in comfortably. 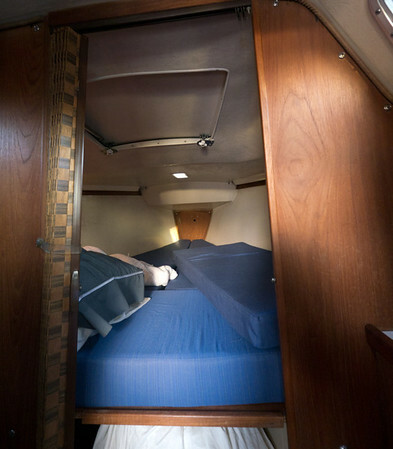 There is another second 1.5 person bed in the back called the quarterberth that we use for storage. 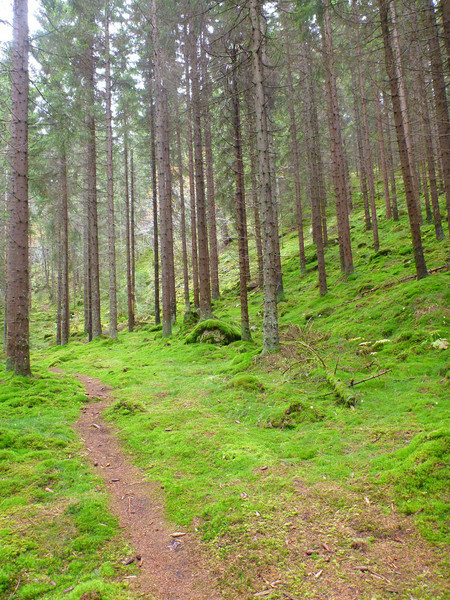 The cabin isn’t big (headroom is around 5′6″), but it’s cozy and much larger than any tent that we’ve camped in. We liked this particular boat because it was in good condition (although dirty), the right price, has a reasonably good reputation, there is great support for it, and it was affordable. There were about 6000 of this model made, an online store that specializes in parts for it (so I could get a replacement rudder in a week instead of making a custom one), and a great online forum with lots of helpful archives and members. It’s not big, fast, or fancy (I think of it as the Ford Focus of sailboats), but it seems like it’ll suit our needs well. Our boat's cockpit. I've refinished a good chunk of the teak, but there is a bit left to go. 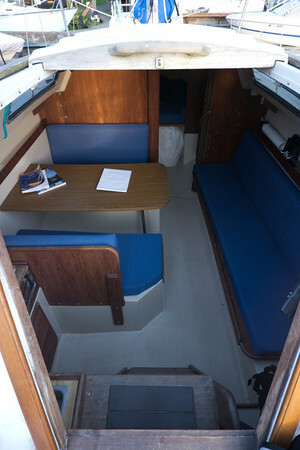 Looking down into the interior of the boat from the cockpit. We had replacement cushions made. 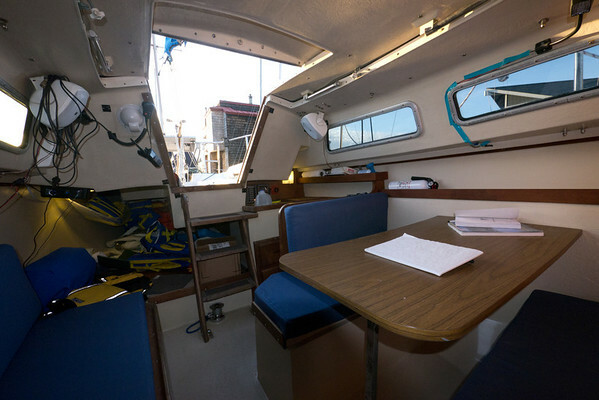 The dinette (which reminds me of a fast food restaurant booth), the galley, and the quarterberth area that we use for storage (my folding bike even fits back there). 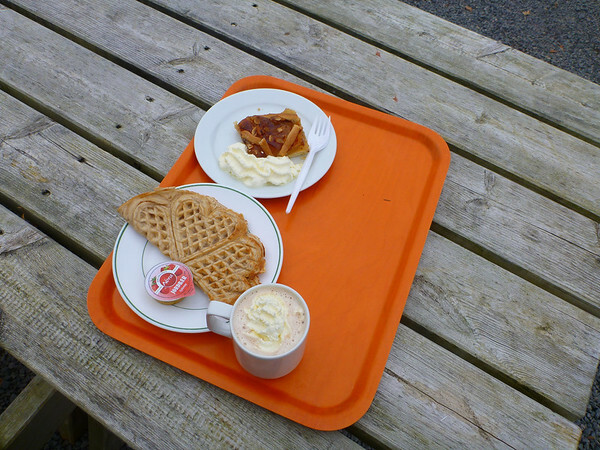 The dinette turns into another small bed when the table is lowered. 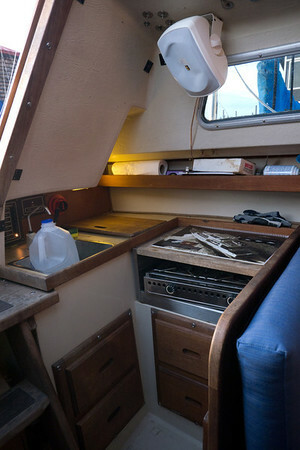 The galley has a sink (we need to clean out the water tank though), and a little two burner alcohol stove, and a built in cooler in the corner of the counter. We also have a grill that sets up on the back of the boat. Our cozy little "vee berth". It's about the size of a double bed with the front corners cut off. 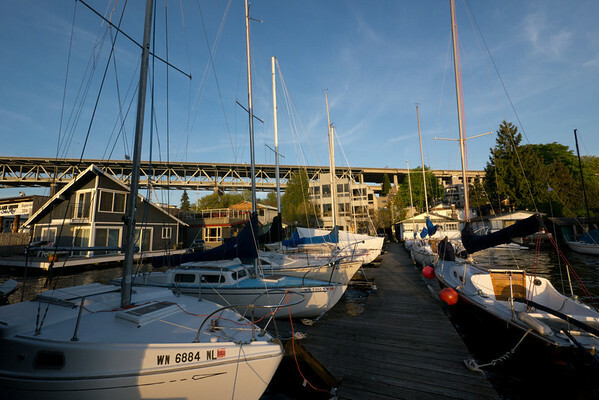 We keep it on a small private marina that is on the northeast side of Lake Union. There are only about 15 boats kept here, but everyone that we've met there has been great. We’ve named her Lutra after Christine’s favorite water critter, the otter. We haven’t put the name on the boat yet. She was previously named the great surprise, and before that appears to have been named Lwellyn. Once we’re done cleaning it up well enough to remove the old names we’ll put on the new one. Travel Gifford on a "Gravel Grinder" group ride. Those are the awesome Compass 26x1.75" tires and I think the bags are from Epic Designs. 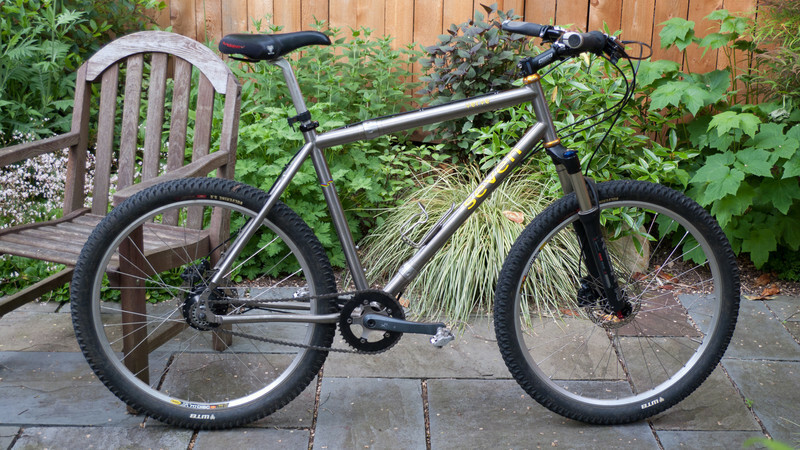 For those who have no interest in boats, but come here for bikes, here is a minor update on the Travel Gifford. It’s been painted pumpkin orange (an homage to the Bridgestone XO-1 and because I’ve never had an orange bike) and my friend Scott has taken it to Australia for a couple of weeks. He’s putting it to great use and has been hanging out with the crowd from “Commuter Cycles” in Melbourne. 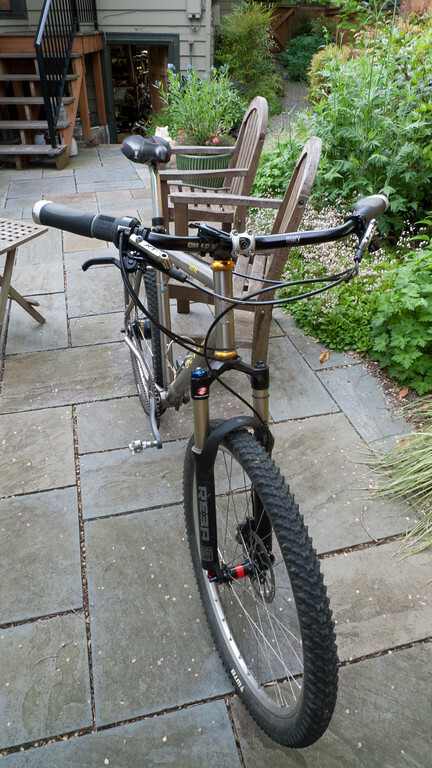 This bike is going to be very well travelled.